Sunday, the 29th of March, saw the running of the Old Scholars, one of the most prestigious Club handicap doubles tournaments. Richmond bathed in autumnal sunshine throughout the day and the excellent weather was reflected in the standard of the tennis. Sophie Johnson and Diane Rennard, representing Monash University, showed early promise on the George Limb Court, overcoming the team on day release from the fashionable rehabilitation institution ‘The Priory’, Lizzie Brown and Andrew Schnaider in an easy contest. The ever-improving James Gould took breaks from doing his VCE homework in the Committee Room to partner his steady father to a series of victories, losing a set late in the round-robin section to Cora Trevarthen and Gerard Powell, representing the University of Melbourne, by which time their place in the semi-finals had been assured. The President follows a fine tradition of trophy-hunting by the leaders and senior committeemen of the Club. Playing steadily all along was another team representing the University of Melbourne, Philip Barker and Robert French. French found the length on his serves as the day progressed and volleyed athletically, while Barker (better known as Captain Sir Peregrine Brace-Girdle-Brace, Bt.) was uncharacteristically ruthless in his single-minded desire to win. Meanwhile, on the Alan Hamer Court, Will McCahey and Nick Shelton, representing Melbourne Grammar, were conquering all before them. Undefeated in the round-robin, they attributed their good play to a strict exercise and diet regime. 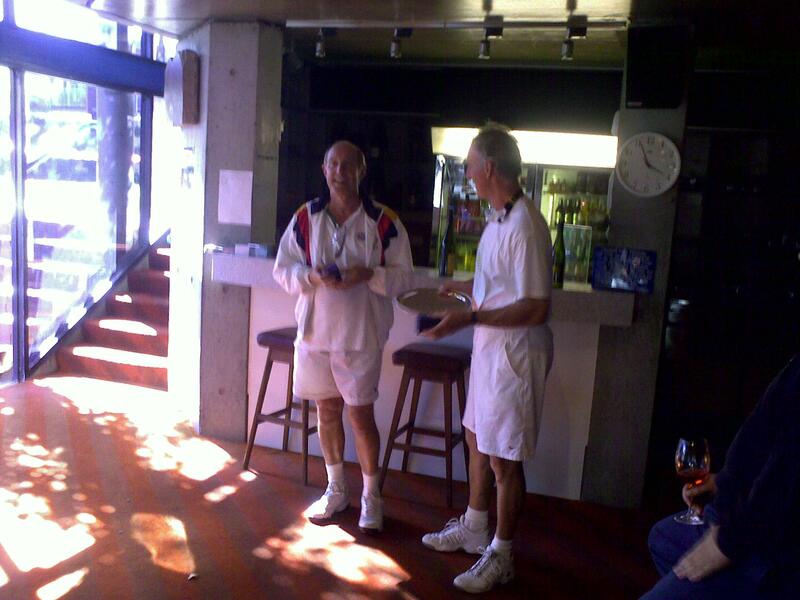 Russ Middleton and Bob Adams, representing “a Melbourne high school”, played some steady tennis, qualifying for the semi-finals. Jeremy Howard and Josef Brunhuber, representing RMIT and Evelyn Howard and Fiona Hewson had some mixed results, narrowly missing out on qualifying. The Oxford pair of Griffith, Q.C. and J.V.C. Guest elegantly lost every match so as to allow James more time to expound upon his latest theorems. A delicious luncheon was taken outside and then the dedans filled with the remaining throng to watch the semi-finals. On the Limb Court it was French and Barker (owe 15) against Middleton and Adams (receive 30) and on the Hamer Court it was the traditional Scotch v Melbourne Grammar contest of Gould and Gould against McCahey and Shelton. Grammar, buoyed by the victory in the Head of the River that day, was too strong for Scotch, winning 6/3. In the other semi, the match was well-contested throughout and stood at 4 games all when Barker, his ruthlessness thinly disguised by an air of apparent nonchalance, switched into a higher gear and brought the set to an end 6/4. French did not miss much, including some full stretch volleys at second gallery which Barker must have thought were for him to sweep at the back of the court. By the final, between the University (owe half 15) and Grammar (love), the excitement reached fever-pitch. The wine had been flowing freely for some time, and the dedans gave all players their full and enthusiastic support. The standard of tennis was high, with many outstanding rests and fine contributions from each player. In the end, the well-practised cunning, guile and experience of French and near-sexagenarian Barker won the day in a thrilling 6/5. McCahey and Shelton were gracious in their defeat; French appeared thrilled with the plaudits and the glory, while Barker attributed his newly-found application to his dictatorial haircut, modelled on the late Romanian autocrat Nicolae Ceauşescu. The dedans filled on a glorious sunny day, wine glasses filled and the usual friendly banter started amongst friends who had turned up to watch the final of the Richmond Cup! Thanks to the eight players that entered and to the pros, particularly Ruaraidh for marking all 3 finals. We all enjoyed the different format of playing best of 3 set matches, which we don’t usually get the opportunity to play. Thanks to all that stayed to support both players in the final. It was nice to see so many people in the dedans! The first day of the tournament went well with hot cross buns and easter eggs going down well with all! This first of the semi finals was a great battle on again a hot day, seeing both players put in a great effort and covering alot of court to participate in some very long rests. I believe every game except one went to deuce in the first set although Peter managed to clinch it quite convincingly 6/1. Peter looked to be stealing the match, having had a ‘rest day’ yesterday due to a walkover. At the beginning of the second set the match turned around and with both players playing some great tennis and long rests, Fiona refusing to give up then appeared to find her groove winning the next 10 games. It was Fiona who got through to the final, finishing the match off 1/6, 6/0, 6/2. Roger certainly looked to be on form having to dig deep yesterday to take Chris Williams to three sets after dropping the first set. Julia came out on court today all guns blazing finding good length on her ground strokes and serving very well, she played a great match which lasted only 45 minutes, defeating Roger 6/0, 6/2. Julia looked to have the edge having had a shorter semi final and serving very well from the beginning of the final. During the first set Julia raced away to a 4/1 lead with some tight serving as Fiona struggled with her own serve. After a slow start Fiona levelled the score to 4/4 but it was Julia that won the set after it went to 5 all. Well played Julia. The second set started very even and then Fiona took the lead, at 1/5 down Julia won a couple of quick games on serve before Fiona closed the set (after a string of favourable mullets!) 6/3. The last set was a tough fought battle with a combination of high lob serves and gentle bobbles perhaps being the difference. Fiona won the tournament in a match that lasted over two hours in the 3rd set 5/6, 6/3, 6/2. The March newsletter has been posted on this site under the Newsletter heading. Find it in the right hand column or click here for the link. 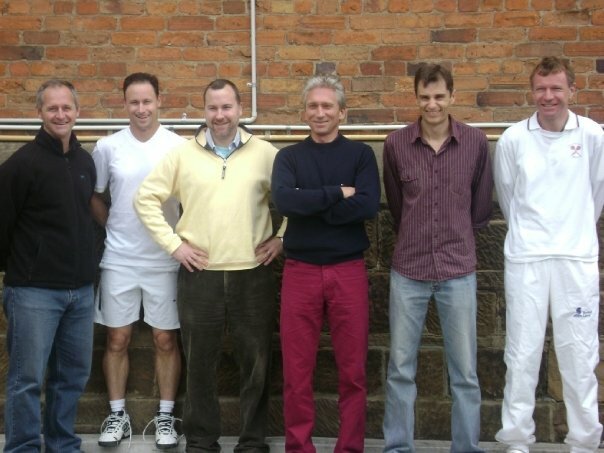 The RMTC retained the Percy Finch Racket by beating the Hobart Real Tennis Club 9-0 over the Labour Day week-end. This is the first time that we have won 9-0 away from home. #1 Julian Snow bt Hilton Booth 6/1,6/2. In the Australian Amateur Doubles final Happell & Richardson bt Snow & Sievers 6/4,6/4,6/1. The week-end was entirely overshadowed by the extremely sad news that reached us on the Sunday morning of the death of George Limb, who had of course played in the inaugural Percy Finch in 1965 and many subsequent renewals. George passed away on Saturday 7th March. It is hard to put into words what an influence George has had over this Club and the game, and on a personal level what a great friend and mentor he has been to so many. He will be sadly missed and the Club offers its heartfelt condolences to Janet and his family. I am thrilled to announce that the Royal Melbourne Tennis Club will be hosting the World Championship in 2010. The precise date of the event will be announced shortly – probably the first week of May. It is planned to hold an opening cocktail party, a Championship dinner and a final dinner on the Saturday evening. 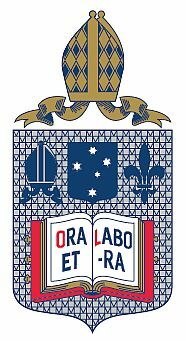 An AFL function on the Friday night is also planned. This will be an exciting week and interest from overseas is already strong, so it will be a true celebration of world tennis. There will also be an International Pro Am and “World Championship” handicap doubles. Application forms will be sent in due course, please book in early to avoid disappointment! Club Championship for handicaps 60 and above. Matches played off scratch, format dependant on number of entries. Last year’s winner was Fiona Hewson. Sign up Sheet on main notice board or call the Pros. Annual women’s handicap doubles tournament, Open to all handicaps. Last year’s winners Judith Sear and Anabelle Guest.